Cable lobbyists are running misleading ads. Stop them. Comcast’s lobbyists are spreading lies to destroy the Internet. Stop them. 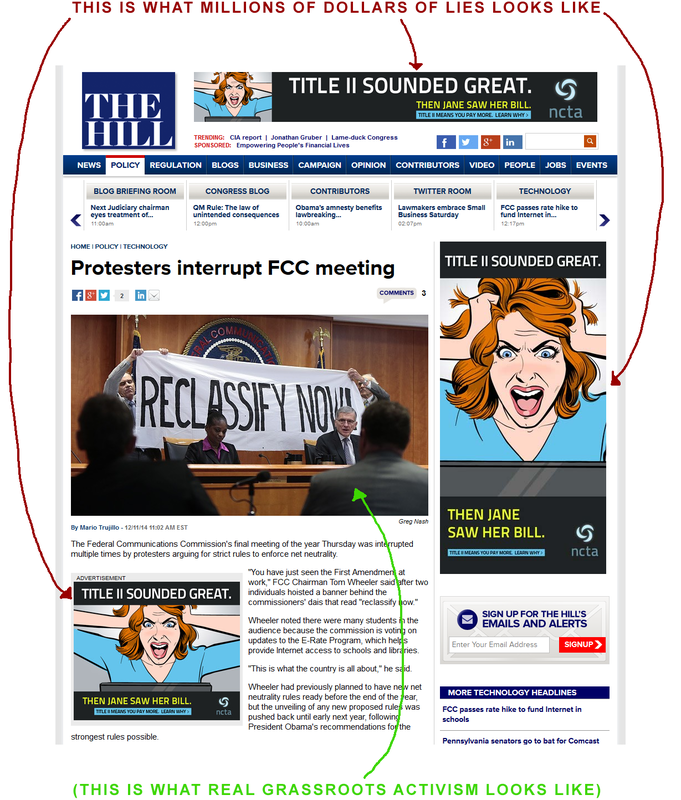 Comcast and their lobbying group NCTA have lost the debate, so now they're blanketing Washington DC with advertisements that lie, to trick Congress into killing net neutrality. We can't let them subvert democracy. That's why we went searching and found their work emails & phone numbers. These are the top cable industry executives and lobbyists who are trying to ruin the Internet. Tell them to stop lying, let's give them a taste of real public opinion. Enter your phone number and we'll connect you to a Big Cable executive or lobbyist at random. Tell them to stop their blatantly misleading advertisements. We'll email you our full list of cable industry executives and lobbyists with links to email them individually or all at once. Tell them to stop spreading lies to destroy the Internet! This is what millions of dollars of lies looks like. The National Cable and Telecommunications Association, or NCTA ("NICK-ta") represents the largest cable companies and ISPs, and it's one of the most powerful lobbies in Washington. 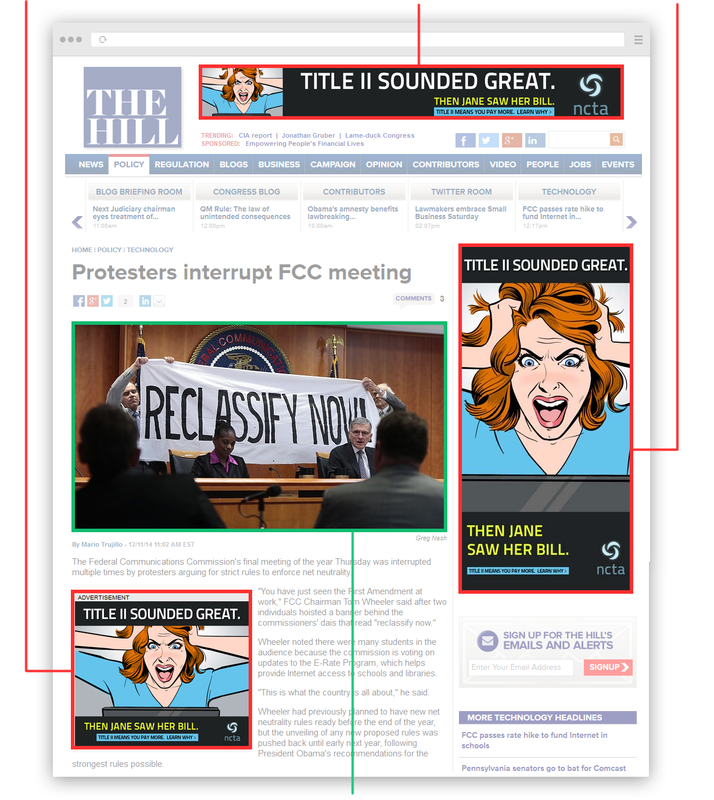 They targeted these ads at your lawmakers, blanketing The Hill and the Washington Post. The message–that Title II would increase taxes & fees–was cleverly aimed at the new Republican majority. And it's completely false. The 1998 Internet Tax Freedom Act prohibits new taxes on Internet access, regardless of what the FCC decides on net neutrality. Net neutrality keeps our bills down. Without it, cable companies' power to charge websites for special access will drive up the cost of everything we do online, from shopping to Netflix. And if you think Comcast is going to use those extra profits to lower your bill, you're crazy. The cable lobby is just spreading Fear, Uncertainty and Doubt (FUD). But we've got their number, in more ways than one. Give them a call. Say how you feel about them bombarding *your* elected officials with blatant lies. "Hi, my name is ______. I'm calling to ask your organization to stop spending millions of dollars on political contributions and misleading advertisements. The American people won’t be fooled by lies, and we won’t settle for anything less than real net neutrality using Title II of the Telecommunications Act." Tweet using hashtag #CallComcast to be featured on our Twitter feed! Check your email. We're sending you our list of cable industry executives and lobbyists, including email addresses and phone numbers. There's also a special link that allows you to CC all of them at once. Tell them how you really feel about net neutrality!